I’m not a fan of Christmas. In my experience, all the bad things in life, they always happen around the Festive Season, and being subjected to Fate’s vicious sense of humour, year in and year out, has reduced my ability to make merry with my fellow man. 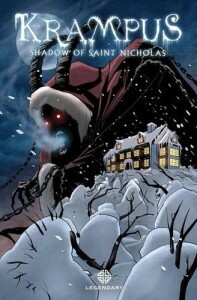 However, as much as the Spirit of Christmas has repeatedly jumped up and down on my clankers, my “suffering” at this most “wonderful” time of the year pales into insignificance when compared to the poor souls visited by the dark shadow of Kris Kringle in ‘Krampus’. I’m guessing that by now, and given our shared delight in the more morbid side of all things jolly, you know who Krampus is and if you don’t, google him. I’ll wait right here while you’re tapping and typing away on the internet. You’re back? Good. He’s quite something isn’t he? Now imagine he decided, along with all of his “little helpers” to pay a visit to a small American town in order to unleash his wrath upon its residents in a multitude of horrific, gory and glorious ways. That my dears, is the idea that flows through the pages of ‘Krampus’, and in three seemingly unrelated tales, that are tied together in the final chapter, Krampus teaches his “victims” the true meaning of Christmas.